1th to 13th May 2018 at Hotel Clarks Avadh, Lucknow. 6th - 9th September 2018, Hotel JW Marriott in Pune. 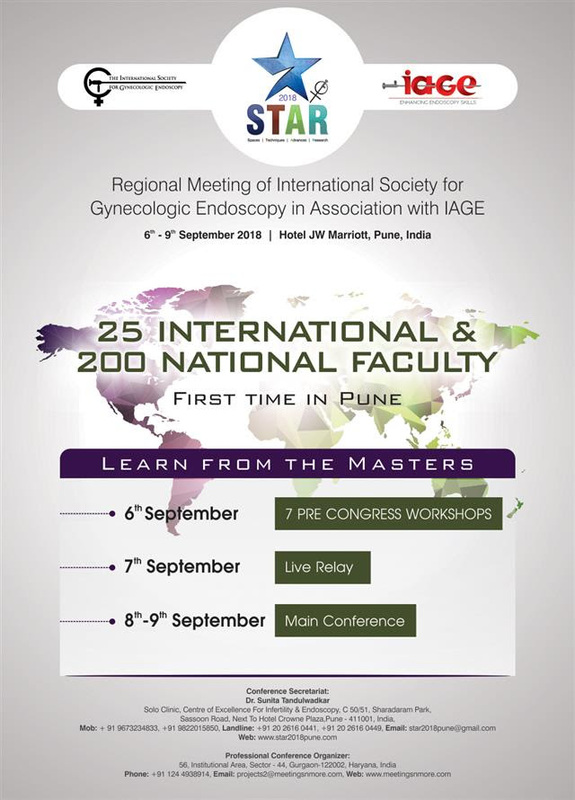 Endoscpic Gynaecology –ENDOFEST, under the aegis of IAGE. 29th and 30th September 2018 at Sonepat Haryana. Surgeries at Tulip Hospital Sonepat and transmitting at the venue- tentatively at Hotel Park Blue . 8th, 9th December 2018, Venue: Thane. Mumbai. Symposium on pelvic anatomy and minimally invasive surgery. In association with Fogsi Endoscopy committee. Annual Conference of the Indian Association of Gynaecological Endoscopists 2019.